Are these genuine Crucial memory? In case my previous reply doesn't show up because the topic was "solved". I too purchaed Crucial memory sticks on eBay and was guaranteed they were authentic, but the labels I have are almost identical to @turbonik. Again, label looks authentic, but chips appear to be SEC/Samsung, but I can't find information on the chip number anywhere. Are these any more legit, or another counterfeit? @krambjas your intuition is correct. This memory has Samsung components which is not what the label says the part should have. This isn't to say you'll never see Samsung components on Crucial memory, it's sort of silly but memory manufactures often will buy memory from one another to use in their own parts, we will even occasionally do that. Due to some slight other quarks in the label it looks like the label was printed, then placed on a non-Micron/Crucial board and parts. I would certainly return this to eBay and notify the seller. It's really hard to tell even for us sometimes. I often have to send the pictures to engineering because I am frequently 90% sure something is a fake, but there is enough uncertainty to warrant me checking with them. 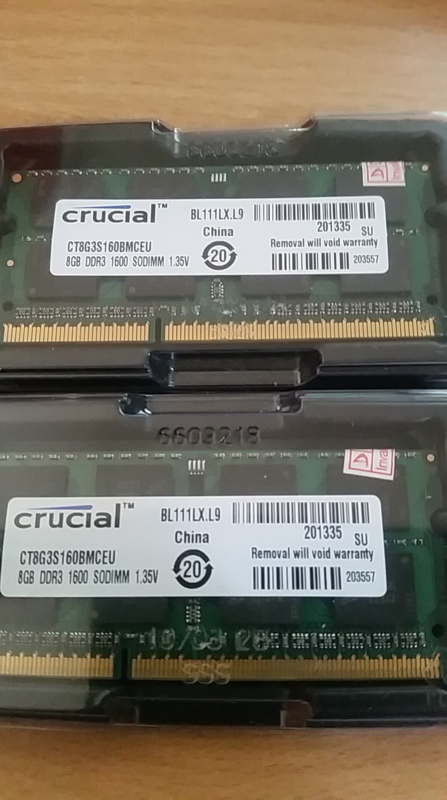 Hi can you please tell me if these PC2-6400 chips are genuine Crucial memory? I just bought them from eBay and cpu-z identifies them both as manufactured by Hyundai. Thanks in advance!